Jama masijid of Jaunpur is a 15th century mosque in Jaunpur which is in the state of Uttar Pradesh. 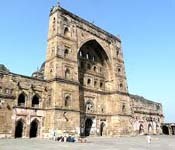 This mosque is one of the main attractions in the town of Jaunpur. Jaounpur is historically known as shareez-e-hind, and this is found by sultan of Delhi Feroz shah Tughluq. In the memory of his cousin Mohammad bin tughluq. The jaunpur sultan attained greatest heights under his younger brother who ruled it. To the east his kingdom extended till Bihar, and to the west up to Kanauj, and he even marched on Delhi at one point. During the reign of Husain shah the army of the jaunpur is probably the biggest in India. And then Husain got the idea of conquering Delhi with his army. However he was defeated on three successful attempts and finally the Delhi sultan conquered the sultan in jaunpur and brought the sultan to an end. 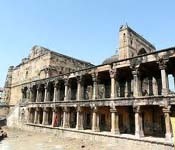 The Jaunpur sultan is the major center for Urdu and Sufi culture, the dynasty here is well known for its relation between Muslims and Hindus. Jaunpur’s independence came to an end in 1480 when the city was conquered by Delhi sultan. Many of the important monuments were destroyed in the city and only some of the mosques are left out. According many of the architects this mosque bears a great deal of resemblance with the mosques built by Delhi sultan and tughluq dynasty. The architectural structure of the mosque attracts everyone to this beautiful mosque. The appearance of the mosque has many factors in it to look beautiful and magnificent for the on lookers. 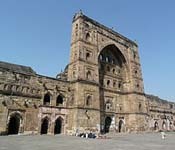 There is a double arched pylon shaped gate at the entrance which is first attraction that is present in the mosque. The highlight feature in the mosque is the rectangular shaped prayer halls in it. The domes and the arcs present in the halls that are meant for prayer attracts everybody. The interiors and the exteriors that are designed in the mosque are very beautiful to look on and the architects have taken all the measures for the mosque to look very beautiful and also magnificent. The mosque is 2.2 kms away north east of jaunpur. This mosque is located in the Uttar Pradesh state in the country of India and is known for its significance. Jaunpur is well connected by all the roads from the major cities in India. Jaunpur has three railway stations in it and for people who want to reach here through rail, one can check out the trains that are reaching this place from which city and also the timings. There is clear information available in the internet about all the trains that are reaching this place. Jaunpur is well connected by road from all the major cities in the state of Gujarat. This place is also connected by all the roads from the major cities in India. One can reach its nearest place in Gujarat and from there it is easy to reach this place.